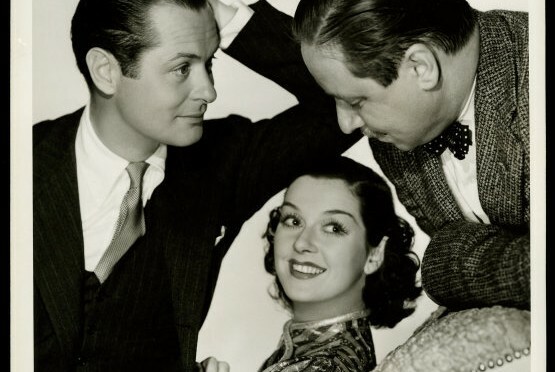 After Night Must Fall finished production, Robert Montgomery and Rosalind Russell were put right into another film together—a film with a completely opposite atmosphere. Unlike Night Must Fall, which is an intense, dark drama, Live, Love and Learn is a rather silly comedy, although it has its sad moments. The way Rosalind makes her first appearance in the film lets the viewer know this will be a funny movie. Montgomery plays Bob Graham and he is a struggling painter. One day, he is sitting in a beautiful countryside, contemplating how to finish his painting. All of a sudden, horses start bounding over the hill behind him and he has to duck to avoid them. There is a fox hunt going on right in the middle of the meadow and he is irate! Finally, the last horse comes jumping over the hill behind the rest, but it throws its rider. The young woman crashes right through Bob’s canvas and she is appalled when Bob seems more interested in how his painting is faring than her, who took a nasty fall. Her name is Julie and she and Bob are from completely different walks of life. He’s poor, she’s rich; he doesn’t always know where his next meal is coming from, she never has to worry about that; he lives in a tiny apartment, she lives in a big house. He insults her skills as a fox hunt participant and shoos her away. A few seconds later, he finds her unconscious on the grass and wonders what to do with her. Before they know it, differences aside, they are getting married. And even so, Bob is trying to talk her out of it because he knows she’s in for a bit of culture shock living with him. Rosalind Russell is doing a radio stint here in 1937, but appears to be wearing the same outfit from a scene in Live, Love and Learn! However, all doubts are forgotten when the justice of the peace tells him to “kiss the bride” and he stares at her, dumbstruck by love. It is in this comedy that besides the sexual tension you see in Night Must Fall, Montgomery and Russell have great romantic chemistry when they get a chance to have romantic scenes. You want them to be together; they are just that cute. They start walking with all of their things to a bus to take them to Bob’s apartment. Julie is actually quite fascinated with Bob’s lifestyle and is excited to live like this. She feels his lifestyle is more real and not full of fake people like in her more high-class community. To show her loyalty to Bob, she throws her wallet out the window and smiles at him. They soon start walking up to his apartment building and she is wearing this hat and the fabric on the top looks like bunny ears. It’s a hat I always remember from her film wardrobe because it is both so funny and cute. “Look, bunny ears!” Bob carries his new bride over the threshold and she takes a look around the tiny apartment, which isn’t even big enough for a full kitchen or bathroom. She is really taken with it and is ready to start living hand-to-mouth, as long as she is by Bob’s side. Bob’s best friend, Oscar (Robert Benchley) suddenly stumbles into the room, drunk (as Benchley often was in films) and tries to kiss Julie’s hand, but falls right on his face instead. In disbelief, Julie questions Bob and he tells her that he’ll be living here with him. After putting Oscar out in the hall, Jerry Crump (played by a young Mickey Rooney) comes yoo-hooing into the room, silly and hyper, and takes a good look at Bob’s new bride. Jerry is the landlady’s son and Bob tries to show him a certain technique in throwing a baseball, but ends up breaking a window. Bob wants so much to be a successful painter for Julie’s sake, and hopes to keep his word on that. The next morning, they all—Bob, Julie, and Oscar—go to the market to buy some groceries because they don’t have food. They have not paid their bill at the market and Felipe (Charles Judels), the owner, refuses to let them purchase anything. Rosalind Russell, Helen Vinson, and Robert Benchley in Live, Love and Learn (1937) – pardon the watermarks from here on out! However, trouble abounds when Julie figures out that Felipe has been overcharging Bob and Oscar for some time because they were too naïve to know any better. They immediately start protesting in front of his store, even telling passersby to tar and feather Felipe. Soon, they are bringing loads of groceries home for free. Julie’s uncle has sent her a letter and a substantial check because he doesn’t want his niece living in squalor. After mistaking Oscar for her new husband, Bob comes home with a monkey named Misery in tow—only one of the several odd things to happen in this movie. He is having a bad day because his work was put down by some art dealers. He goes to the park with his wife to paint. This peaceful scene gets out of hand when a few Marines (Leathernecks) and then a few Navy sailors (Tars) start gathering around Bob’s canvas, giving differing opinions on what they think of it. The Leathernecks stick together and the Tars stick to their opposing opinion until they start fighting. All of a sudden, Bob and Julie are in the middle of a riot in the park and are blamed for starting it! They spend a night in jail and when they come home, they notice a large crowd of reporters on the stairs and sneak into their apartment. Refusing to talk to reporters, one reporter decides to pose as an art dealer in order to get a story on them. Naturally, Bob is excited about this, but Julie notices the man’s press pass in his hat. The man is immediately thrown out (literally). Soon, the three of them have developed a new hobby. Since the reporters keep coming in droves posing as art dealers to talk to the poor, struggling painter, they devise new and unique ways of depositing them into the hall. An important art dealer named Bawltitude (Monty Woolley in his usual grumpy, cantankerous, but hilarious role) becomes interested in Bob and visits his apartment to take a look at his work. Of course, Bob, Julie, and Oscar assume he is another reporter, so they proceed to anger him. They have stacked a large pile of books and put a pitcher of water on top of them and tell him to take a few steps backwards until the pitcher of water has poured all over his head. They then do the silliest thing—they cut his buttons, suspenders, and tie in half. As Oscar and Bob try to pull on his beard, which they assume is fake, Julie finds out that he is the real Bawltitude. Bob stares at Bawltitude in disbelief and Bawltitude yells at him, “Get your hands off me, you homicidal maniac!” Hard feelings are obviously put aside when before they know it, Bob’s work is being presented in a gallery by Bawltitude. It is at this time that Bob starts acting differently. He starts becoming more well-known and respected by the rich art buying community and Julie feels she is losing the old Bob that she fell in love with. When he buys a big, beautiful place for them to live in, Julie thinks it’s a joke and after bewildering him by yodeling in the place, then swinging her arm wondering if she could swing a cat in the place, she starts “skating” across the polished floors. (Let’s just say this is a very strange group of people!) She is saddened when she finds Bob is serious about it and is very unhappy when her old pal Lily starts attaching herself to Bob in order to build him up. Now again living the lifestyle she voluntarily left, Julie is very unhappy and only talks to Oscar, who has not changed a bit. They play games and Julie explains that when someone comes to the door, the third butler answers the door, who tells the second butler, who tells the first butler, who then informs her about it later. They start pretending to be high-class snobs, Julie describing herself as “so, so alive, so eccentric—I mean electric!” Meanwhile, Bob has had many jobs painting boring, stuffy dowagers. Lily brings over a new client named Mr. Palmiston. He is played by E. E. Clive, who played a large part in getting Rosalind Russell’s acting career started when she pretended to be English in order to get into his acting troupe. It was acting in this troupe that got her discovered by a Hollywood scout. He also plays small parts in two other Montgomery-Russell films, Trouble for Two (1936) and Night Must Fall (1937). He is most memorable in this film, however, because of the way he says everything in threes. When he meets people, he says, “How do you do? How do you do? How do you do?” and thanks people like this: Thank you very much, thank you very much, thank you very much. Julie doesn’t like this atmosphere very much and goes off riding: “I feel like digging my spurs into something.” She comes back with a very kind old gentleman who is an art teacher and a very promising young pupil of his. They want to give a “Robert Graham Day” soon and have him speak. However, he decides that painting for Mr. Palmiston is more important and Julie is gravely disappointed in him and where his priorities lie. After Bob snubs the two people, Julie gets very angry with him and tells him he’s become a big fake and she can’t stand it anymore. Lily tries to get her opinion in, but Julie walks very slowly up to her and says, “Lily, darling, has anyone before told you, in an awfully ladylike manner, to keep your pretty little schnozzola out of other peoples family fights?” She paints a mustache on Bob’s portrait of one of the old matrons he is working on. Bob yells at her and ends with calling Oscar a drunken clown and orders him out of the house. Having lost the man she remembered, Julie asks for a divorce and leaves with Oscar. It is this part of the film I don’t enjoy very much. It’s all fun and games until Bob becomes someone he’s not and causes terrible marital discord. However, when Bob tires of this dull lifestyle, he goes to speak for the art teacher’s class like Julie wanted him to. She is there to listen to him and happy to have him back. She reunites with him and they decide to have some fun for the road. She and her two partners in crime go to Bawltitude’s place and bring in a portrait Bob did of Palmiston’s horse. Palmiston comes running in, his pants falling down (because they had cut his suspenders like they always do), and pleading with Bawltitude. Julie pulls her cape up over her head and growls at him like a tiger. Yippee! I have moved away from the year 1935 and will now continue this series with 1936, a year in which Rosalind Russell made 4 films. The first of those four is called It Had to Happen co-starring George Raft. Roz was known for being a practical joker in those days, whether they were pranks pulled on her co-stars or later on her own husband. While she was making this movie with Raft, they made a football bet. Her team lost and she had to pay up. So she did—by delivering a huge bag filled with pennies to his doorstep. Well, hey, as long as it added up to what she owed him, right? When I watch It Had to Happen, the first thing I notice is the difference in height between the two stars (actually, lack thereof). 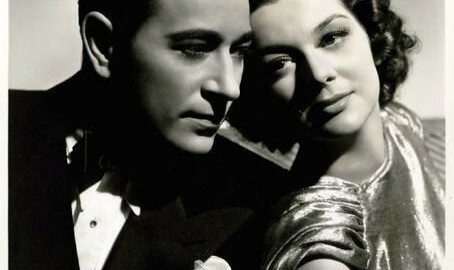 George Raft was 5’7” and Rosalind Russell was about 5’8”. Throughout the film, it looks a little bit awkward that Roz is playing love scenes with a man who just wasn’t tall enough for her. In some scenes, I am almost sure he must be wearing lifts to seem a bit taller, although it doesn’t help his case much. But I am also not overly critical of this movie. I like it and enjoy it. I believe Rosalind and George got along with each other in real life and although it appeared awkward when they were dancing, the chemistry is not nonexistent. The film opens on a ship going to the United States and Rosalind Russell, playing Beatrice Newnes, is shown being interviewed by scads of reporters. She is called “the richest girl in the world,” as farfetched as that sounds, and is constantly being questioned about who she will marry. She thinks it’s all fun and games as she smiles and answers their question while carrying her dog in her arms. However, when they ask her about a man named Rodman Drake, a man she left at the altar, she says emphatically, “That is a question I cannot answer,” and runs off. When she goes down into the steerage area, she meets Enrico Scaffa (George Raft) for the first time. She stands next to him as she tells the person in charge her information, and he stares at her the entire time without blinking. She doesn’t even notice and turns around, walking away, breaking her heel in the process. Enrico walks over and hands her the purse she left behind. He picks up her heel as well and a funny thing happens as she trips and falls, then he does the same and falls on top of her. Embarrassed, she quickly gets up and runs away from him. Clumsily, she has to keep picking up her things that she repeatedly drops along the way. This has to be mentioned because Rosalind Russell was known for her comedy skills. Maybe she wasn’t known for them at this point in her career, but as her skills were honed in small, subtle scenes like this, it is interesting to see how they blossomed as time passed. Enrico and his pal Giuseppe Badjagaloupe (Leo Carrillo)are immigrants coming to the U.S. for the first time to get work. I must mention here that the spelling of Giuseppe’s supposedly Italian last name shows some ignorance in movies back then. I am no expert on the Italian language, but I do know that no Italian name would be spelled in this way. What they did was spell it the way it sounded to them. I have always found this strange and not very authentic. But you can’t always expect authenticity from a black and white film from 1936. Enrico and Giuseppe eventually get a job in construction. They make it a point to show that Enrico lets people walk all over them because he doesn’t like fights, but it doesn’t take long before the bullying American workers rile him up. By the time he and Giuseppe are working in construction and he is given the “honor” of holding up the red flag which stops traffic, he suddenly feels differently. It is also here that he meets Bea again. They haven’t seen each other since the boat, but he notices her and hands her the heel she dropped. Absolutely bowled over by the fact that he still had it with him, Bea explodes with peals of laughter. Rico yells at everyone who barks at him for stopping up traffic, including the mayor, who usually has special privileges. When Rico’s boss calls him a “dumb foreigner” for yelling at the mayor, Rico responds with a punch to the boss’s jaw. Now that Rico has been fired, the mayor snatches him and his pal up to work with him in politics, admiring Rico’s attitude. It doesn’t take long for Rico to become well known in politics as he keeps getting promoted and has a talent for getting important people out of trouble without doing anything illegal. He is an honest man and makes sure others know it. Rico learns about a problem at a trust company where $4 million were embezzled out of the bank. The man behind this is Rodman Drake. Rico goes to his house, where he finds that the man has married Bea, the woman Rico has loved ever since he saw her on that boat. Bea recognizes him right away and acts very indifferently to him because he keeps showing up in her life. As she plays the piano in the living room, she keeps looking back at Rico, very wary of his presence. She soon learns what has happened at the company and that if Drake doesn’t give Rico the $4 million to put into the trust company himself, Drake will be indicted. Back at Rico’s office, he has a secretary named Miss Sullivan (Arline Judge) who is clearly in love with her boss. However, she becomes jealous when Bea arrives at the office and she realizes Rico’s infatuation with her. After Bea promises Rico he will get the money to get her husband out of trouble, he constantly tries to ask her for a date, which she refuses each time. Finally, at the horse track, he bets her that if his horse wins the race, she has to go out with him. If her horse wins, he has to stop asking her. She agrees and after she excitedly sees her horse, Queen Anne, win, he sadly shakes her hand and with a tip of his hat, he takes his leave. Before he knows it, that evening, Bea has shown up at his apartment. Feeling sorry for him, she asks him out on a date herself. They go out on the town, dancing and drinking champagne all night. The date ends with them sitting outside, looking at the moon, which Bea swears there are two of (too much champagne). When she gets home from the date, she realizes she is in love with him. She also finds her husband has come home again after being away in Cuba, running away from the scandal he is caught up in. She tells him she wants a divorce because she is in love with another man. He refuses and she relents, telling Rico she needs to stay with her husband because he doesn’t have anyone else or any prospects. However, Bea can’t stay away from Rico and eventually agrees to marry him after she has divorced her current husband. But when a group of crooked men start to make it look like Rico stole the $4 million from the trust company, he is suddenly in big trouble. By his lawyer’s advice, he decides to flee to Canada for a while and he wants Bea to come with him. She refuses to go anywhere with him, saying he is doing exactly what her husband did. She tells him, “I thought I fell in love with a man. Sorry. My mistake.” This is a brutal blow to any male’s ego and Rico goes to the hearing and tells them exactly what happened—that he did everything honestly and only so the stockholders at the bank won’t lose their money because of some crooked man like Rodman Drake. The judge understands that Rico has caused no harm and lets him go. Rico immediately runs over to Bea’s apartment, bursts into her bedroom, and pulls her out of bed, yelling at her that she will love him and marry him. It is almost as if he is ordering her to do so and surprisingly enough, she likes this kind of treatment and smiles at him as he tells her to kiss him… and again… and again. This is a fairly good romance even if there some things that I found ridiculous. It is definitely worth a watch, especially for Rosalind Russell fans because this is one of her more rare movies. “My word, I thought, a ten- or eleven-year-old having that bright red polish put on, and suddenly the hood of the dryer went back and the child stood up and it was Jean. She was probably twenty-three at the time, but without any makeup and no eyebrows, she looked exactly like a little kid,” Rosalind Russell wrote of her Reckless co-star, Jean Harlow. Russell and Harlow became friends in the short time they knew each other, but Rosalind was often called upon to get Jean out of jams, such as dragging her out of bars before she got herself into real trouble. Rosalind described Jean as a very sad girl, and it was certainly devastating to all when her life was suddenly taken from her at the tender age of 26. When Roz made Reckless with Jean Harlow, it was the year 1935 and she was still stuck in rather limited supporting roles. However, she got to work with two great stars in this one—Jean Harlow and William Powell. These two were in love with each other at the time and Jean was very excited to finally make a film with her beloved. Unfortunately, this film is a bit of a clunker and wasn’t the success they wanted it to be. Also along for the ride is Franchot Tone, who, unlike his usual characters, is a boozing jerk in this one. The actor was not very charismatic, but he got the job done. The true star of Reckless is clearly Jean Harlow. She plays Mona, a singer and dancer who was a thorough professional, but sometimes got herself into trouble. Ned, played by William Powell, is an old friend of the family’s and is often called upon to help Mona out. He is a sports promoter and as Mona’s grandmother (May Robson) says, Ned is “like a great big brother to Mona.” After Mona is jailed for reckless (just like the title) driving, he gets her out in time for a benefit performance, but he fixes it so she has to return to jail after she is done. The benefit is for a faux group called SAML (Society for the Admiration of Mona Leslie). Bob Harrison (Franchot Tone), drunk as all get out, has rented the entire theater just so Mona can perform for him. This movie gets its name from the song sung by Mona called “Reckless,” which is the first song she sings, and then reprises in the final scene. Jean Harlow’s singing is dubbed and she clearly does not do her own dancing, either. This is apparent because when Jean dances, you can only see the top half of her body, and then when the dancing legs are shown, it is filmed from such a distance, it could be anyone’s uncle in a platinum blonde wig. Next we get to the story of how Ned has been in love with Mona for a while, but she never takes him seriously as anyone but a “great big brother,” so he does not know how to tell her. The girl says her name is Jo Mercer (Rosalind Russell) and Mona immediately realizes who she is. Jo does not seem to blame Mona at all for breaking her engagement, but Bob instead. After all, Mona didn’t know Jo existed before they got married. Soon after, everyone (Ned, Mona, Bob, Jo, and some other friends) are at the horse races and Jo announces that she is getting married. She also makes sure to glance over at Bob to gauge his reaction. Naturally, he looks rather upset. At Jo’s wedding, Bob proceeds to get smashing drunk and Jo confronts him about his behavior. At first, she jokes about how she felt she was “getting on in years” and decided to marry the first man who came along. This joking manner quickly turns to anger when she feels he is insulting his wife, Mona. Mona happens to be walking by when he tells Jo that Mona “trapped” him into marriage, keeping him away from the girl he really loves (Jo). This is heartbreaking for Mona and although she is coerced into putting on a show for everyone, she has tears in her eyes as she sings and dances. What happens next is tragic. Bob doesn’t feel he can live with himself any longer and shoots himself in his bedroom. This opens up a horrific scandal for Mona, as she is pregnant and subsequently gives birth to an adorable baby boy. Mr. Harrison, Bob’s father, tries to gain custody of the child by alleging that it is Mona’s fault that his son is dead and that Mona is an unfit mother, being a “show person.” He does not get her child, but in the end, she gives a performance to revive her sagging career caused by the bad publicity. Although Jo is there fully supporting her like a friend would do, once Mona starts singing, people in the audience start hissing, booing, and trying to disrupt her performance. No longer able to stand it, Mona shouts at them, “How dare you! How do you dare?” In a moving speech, she tells them that what happened is no more her fault than anyone else’s, that Bob was a sad man always drowning himself in sorrow, and that the audience should not be rude and interrupt her performance. As she sings her signature song, Ned proposes to her again. As everyone applauds, she takes his hand, signifying “yes” to him. Rosalind does not even appear in the film until almost 50 minutes after it starts. And since the movie is a bit bland, it is a long wait for any Roz fan. I try to console myself with the fact that I am watching two great stars in their prime—Jean Harlow and William Powell—but the movie falls flat. However, there is something that makes Roz stand out in this film, and that is her costumes, particularly her wedding dress. It is a beautiful creation by Adrian and it flows gorgeously behind her as she walks down the aisle. It is nice to see a real life couple in a movie in which they end up together, but it is a shame that it wasn’t very well executed and has a mediocre script. I give the film 3 stars out of 5. Whenever I need a good movie about aviation, I just pop in West Point of the Air—Oh, hold it. I never need a fix like that. As you can probably tell, this type of film isn’t really my thing, but I enjoy it nevertheless, and Rosalind Russell’s character Mrs. Dare Marshall is a small part of the reason. The film stars Wallace Beery, Robert Young, and Maureen O’Sullivan. Wallace Beery plays “Big Mike” Stone—I am going to be truthful here and disclose the fact that I am not a fan of this man. I am not saying that I wouldn’t mind throwing a vase at the television every time I see his face, but—yeah, I’m going to say that. However, I am going to remain as impartial as I can and focus on the actual character he plays. He is the father of “Little Mike” Stone, played by Robert Young, who was indeed young—only in his 20s when he filmed this. A childhood friend and sweetheart named Skip is played by Maureen O’Sullivan and she does well in her role, adding just the right amount of sweetness but showing her strength toward the end of the film. The film opens with Skip and Little Mike as young children, about 5 years old or so. Skip also has a brother named Phil (Russell Hardie) and the three spend a lot of time with each other, playing and learning. Big Mike is also friends with Skip’s and Phil’s father, (Lewis Stone), as both men work in the world of aviation. Also hanging around is Big Mike’s buddy, “Bags” (James Gleason), also called “Marble Head” by Big Mike. It is natural that Phil and Little Mike devote their time to flying airplanes when they grow up because both their fathers have worked on airplanes their entire lives. As the three children blossom into young men and women, Little Mike and Skip carry on a budding romance and the two young men go to West Point for flying school. They are both in the Army and Little Mike even plays for the Army’s football team. This is a source of pride for his father and he is excited to watch his boy in the football game against the Navy team. This is when Rosalind Russell makes her first appearance in the film. She plays divorcée Mrs. Dare Marshall and is seated behind Big Mike in the bleachers. She is sitting with a gentleman friend of hers and Big Mike seems greatly bothered by her existence as she keeps on talking during the game and even takes a drink from a flask to warm herself up. When his son makes the winning touchdown, Big Mike is shielded from this great moment as a woman in front of him falls on top of him in her excitement. However, he turns to Dare and tells her she has good taste by betting on the right team. When she discovers Little Mike is his son, she asks if she can meet him. After the game, there is a fun party where Skip and Little Mike dance under the sparkling lights and celebratory confetti. Dare makes her way toward Little Mike, telling him how excited she is to meet him, and immediately invites the whole group to the theater where they are going to watch the newsreel of the game. She figures now Big Mike can see his son make that historic touchdown. However, during the big moment in the theater, a group sitting in front of Big Mike decides to get up and leave the theater. Perfect timing! Although Big Mike has missed the celebratory moment twice, he is still as proud of his son as ever. When they all drop Skip and Phil off on the train, Skip tells Little Mike to be sure and take care of himself, to which Dare replies, “Don’t worry! I’ll look after him!” while taking his arm. Naturally, Skip is worried about this. And with good reason—soon, Little Mike has two framed photos of women on his mantle: one of Skip and one of Dare. To get back to the subject of flying, it is important to note that Little Mike loves to fly, but is a bit too cocky about his abilities and does not take any of it seriously. He would much prefer to do fun stunts in the sky than study the proper way in which to handle a plane. When Skip refuses to go out with Little Mike because she knows he has an important 60-hour solo flight the next morning, he is disappointed… but not for long. When he gets back to his quarters, he finds Dare there, waiting for him. Dare only means trouble for him as she persuades him to stay out all night, even though he has an important test in the morning. At 1 am, he is at her house, having a drink, and it is subtly implied that he spends the night there instead of going back to his quarters. This implication is topped with her line, “Well, you don’t have to solo tonight, do you?” as she hands him a drink. He takes the glass from her, a way of accepting her invitation. They drive out the next morning in his car onto the air field, and cause Phil to narrowly miss them and crash nearby. Phil has to have his leg amputated and Little Mike blames himself for having the car there in the first place. The constant presence of Mrs. Dare Marshall is a worrisome problem for Big Mike, who is never pleased when she is around. He obviously sees her as a predatory divorcée who will bring his boy to ruin. Rosalind Russell wrote that Robert Taylor started at MGM the same day she did (Life is a Banquet). And in this 1935 film, we can see who was the bigger man (or woman) in town. Russell has a significant role as the “other woman” while Taylor maintains a very small part as a fellow flying student who meets his demise in a plane crash toward the end. However, as many classic film buffs know, Robert Taylor would become a much bigger star than Rosalind Russell was. It was just a matter of when his big break would come. The end of Mrs. Dare Marshall comes at a crisis point for Little Mike. She is happy to get him away from the world of aviation as he has recently quit the Army and flying for good. However, when Skip comes over and gives Dare a good talking-to about what is really important in Little Mike’s life, it is clear where Little Mike’s heart lies. Dare explains to Little Mike, “You never looked at me like that… almost as if you were hungry. I wonder if I’m going to lose you every time you hear a plane.” He indeed hears a plane outside, noticing it is his father. When he runs off to try to stop his father from doing something foolish in the air, Dare waves goodbye, looking a little sad, but also resigned to the fact that Little Mike would never be able to quit flying. To conclude, Rosalind Russell was very competent as the “other woman”—a mature divorcée whose life experience and habit of throwing caution to the wind was most likely what attracted Little Mike to her. The rest of the cast also does well, even Wallace Beery who, as I wrote above, I am not a fan of. As long as I try my best to be an impartial observer, I think I can look past the gruff exterior of this man to see something (maybe) of a proud father in his characterization.